The study was published as an open access article in the scientific journal Proceedings of the National Academy of Sciences of the United States of America, (http://www.pnas.org/content/early/2014/02/28/1311014111.full.pdf+html). Beetles are very habitat specific, well known, and have been well preserved as fossils and sub-fossils. 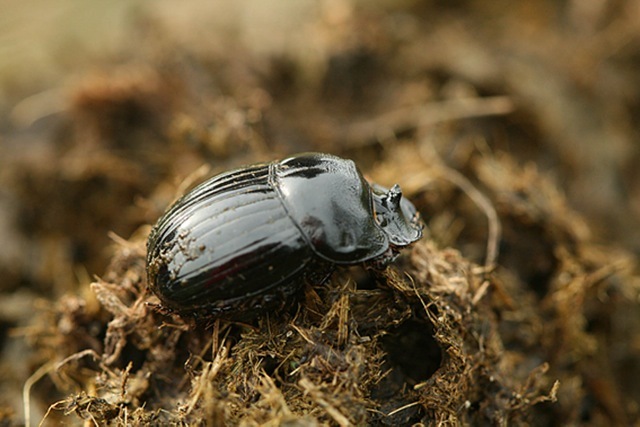 A rich presence of woodland-associated species indicates a closed canopy forest, whereas many dung beetles reflect sun-exposed, open landscapes with the presence of large herds of herbivores. For most of us, dung beetles are quite an unknown group of animals. The Sacred scarab beetle or Scarabé is probably the most famous of them. The ancient Egyptians believed that Khepri – the God of the Rising Sun and symbolised by the Sacred scarab beetle – renewed the sun every day, before rolling it above the horizon, then carried it through the other world after sunset, only to renew it, again, the next day. The Sacred scarab beetle has also been featured in ancient, Greek mythology (e.g. in Aesop’s fable “The Dung Beetle and the Eagle”), but also by more modern authors like Franz Kafka, P.G. Wodehouse and Edgar Allan Poe. 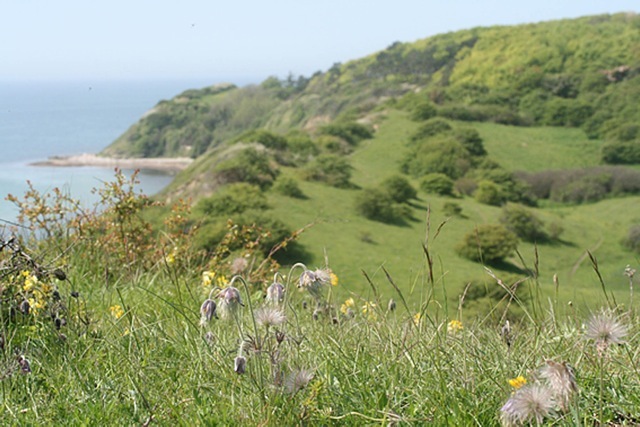 Scientists from the Aarhus University in Denmark decided to take a closer look at the presence of different habitat-specific beetles in Great Britain during four time periods: the Last Interglacial (132,000 – 110,000 years Before Present, B.P. ), the Last Glacial (here, 50,000 – 15,000 years B.P. ), the Early Holocene (10,000 – 5,000 years B.P.) and the Late Holocene (2,000 – 0 years B.P.). During the first period, the many large herbivore mammals – such as the extinct straight-tusked elephant and the narrow-nosed rhinoceros but also roe deer, red deer, fallow deer, beaver, bison, wild boar and aurochs – roamed the British Isles. In the glacial period, modern humans had arrived and lived alongside species such as moose, bison, aurochs, red deer, woolly rhinoceros, wild horse, woolly mammoth, giant deer, muskox, reindeer and saiga antelope- together with the cold climate restricted the tree growth and woodland cover. In the early Holocene, only seven large herbivore species remained in Great Britain: moose, aurochs, roe deer, beaver, red deer, wild horse and wild boar – all the so-called mega-herbivores were then gone. Most probably killed off by early man. Finally, during the Late Holocene, farming has dominated Europe and the many domestic herbivores (sheep, cattle, pigs & goats) took over the landscape almost completely. With only ibex/wild goat, chamois, roe deer, beaver, red deer, fallow deer and wild boar left, in practice. So, how did our landscapes change over these four periods? During the Last Interglacial, there was a great representation of dung beetle and relatively few woodland species indicating a landscape dominated by wood pastures and with rather limited distribution of closed forests. In the Last Glacial, the cold climate prevented development of closed forests and Great Britain was basically an open landscape. However, in the early Holocene, semi-closed and closed forest was much more prevalent. This was either because of human hunting of large herbivores or that the loss of the mega-herbivores (elephants, mammoth and rhino) reduced effectiveness of the grazing and browsing pressure that would otherwise suppress tree establishment. Then, in the Late Holocene, but still before industrial farming, humans dominated the landscape and the massive impact of farming and the connected domestic animals, generated a composition of dung beetles quite similar to that of the Last Interglacial period, and we actually ended up with a pretty similar landscape as well, when it comes to the degree of openness and closed forest cover. Neither the variation in climate, nor the frequency of wild fires can explain the patterns found. It is also believed that the changes found for Great Britain also apply for the temperate part of continental Europe – and maybe even for North America and Eastern Asia as well, which all suffered similar losses of mega-fauna as Europe did. What lessons can we draw from these findings when it comes to the management of nature in modern Europe? One of the strongest key messages from the study is the “important role for large herbivores in driving vegetation dynamics and in current efforts to promote landscape diversity through rewilding”. The authors also emphasize the importance of, so called, abiotic landscape factors such as topography, hydrology and soil conditions. On the “biotic” side, the presence of large carnivores is certainly also very important. Since most of the mega-fauna of Europe went extinct, we have to work with what we have left, such as European bison, different species of deer, moose, ibex, chamois, beaver, wild boar as well as considering de-domesticating horses and cattle (“Tauros”). However, the ecological impact of large herbivores must always be seen in a wider ecological context with as many as possible of the other natural processes as well, both biotic (e.g. large carnivores and herbivores, insects and vegetation) and abiotic (water, wind, fire, minerals, avalanches, etc.). How this will shape European nature in the future still remains to be seen – but it stands to be a wilder future!